Bruce Thompson Sr., beams with pride when speaking of his chess playing sons, Bruce Jr. and Akeem. Akeem was persistent in his request to learn the game that had captured his imagination. Bruce Sr. states, "Akeem used to ask me occasionally, to teach him how to play chess. He began to ask me more often, then on a daily basis, (some times a few times in a day). I think that I was waiting for him to get some-what older so he would be able to handle the abstract ideas better . . . Since he kept asking me so often. I decided to attempt to teach them. Both at one time. It was October 1994. Bruce Jr. had just turned 9 years old in September and Akeem was 4 years old. He would turn 5 years old in November, the following month." He taught both of his sons to play at the same time and within two weeks, they were engaging in battle. Both sons had an insatiable appetite for the game and had intense battles, mostly breaking even. They would then test their skills on family members and friends with mixed results. Some of these players who were victims thought of themselves as accomplished players. "My wife would get a kick out of seeing Bruce and Akeem beat people and tease the people when they lost to the boys. I still had not introduced them to the "chess world," says Bruce Sr. In November 1996, both Bruce Jr. and Akeem went to their first rated scholastic tournament; they were 11 and 6 respectively. In these small "quad" tournaments, Bruce brought home the first scholastic prize in the Thompson family by winning 2nd place. The Thompson boys would play in three more scholastic tournaments in November and began accumulating a small collection of book prizes. When Bruce broke his ankle in a December fall, he had to wear a cast for 6 weeks. Distracted by his immobility and perhaps irritated by the cast, he asserted that he couldn't play chess with a cast on. Perhaps this was the point at which Akeem would propel his game forward. In order to satisfy his competitive appetite, Akeem continued his tournament activity. Following are comments by Bruce Sr. In January 1997 I entered Akeem in the Liberty Bell Open at the Adams Mark Hotel (Philadelphia, PA). He played in the under 800 section (almost all adults with a handful of children) he was rated 629 /12 games. Between the rounds was very difficult to handle Akeem's energy (he is a person with a lot of energy and likes to play. Akeem had turned 7 years old about 2 months ago.) so between the rounds, I supervised him for 15-30 minutes playing on the large rocks and in the field outside, in back of the hotel. Then I made him take a nap for about 30 minutes. After 4 rounds Akeem was 4-0. In round 5 the schedules converged. Akeem had to play a man who was also 4-0 they both led the field. Akeem went on to win that game and finished with a perfect score 7-0. He led the field by at least a full point. The trophy was literally half Akeem's height. I was very, very proud. When he carried that big trophy in the house everybody's mouth dropped. Born on the 16th of November in the year 1989, is like many other young boys his age. Akeem likes to play basketball, football, he likes any type of physical or mental competition or challenge. However, Akeem has made rapid progress in his short chess career and is the top 11-year old in the state of Pennsylvania with a 1701 rating. "Akeem could see things and put together stuff over the board that amazed me sometimes. When he had that serious intense look you'd better watch out," Bruce Sr. proudly remarks. Akeem like blitz and bughouse (team chess), but is discouraged from playing between rounds during a tournament. He sometimes plays blitz on the Internet Chess Club, but prefers to play face-to-face competition, so from time-to-time Bruce Sr. will take him to the local club. 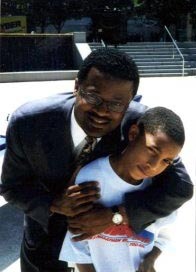 Akeem pictured here with GM Maurice Ashley at the 2001 Chessathon. 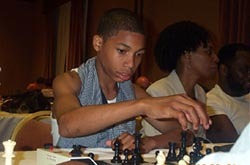 Akeem is the currently the highest rated 11-year old in the state of PA (1701 USCF) by about 300 points. In all, Akeem has approximately 26-27 chess trophies up to three feet tall. He has also won a couple of medals, books, ribbons, and some cash prizes. Bruce Sr. remembers, "In his very first cash prize was a split. His share was $6.00 and some change. He was happy. He was maybe 7 or 8 years old. Bruce Jr. has about 17 chess trophies. There are about 44-45 chess trophies in all belonging to Bruce Jr. and Akeem." Akeem's biggest upset was Evan Post 2070 in a Game/30 Championship. At that time, Akeem was rated 1468. There will be many, many more of these scalps, so beware when young Akeem sits across from you! Pavolic (1746) - Gregory-Thompson (1468), 0-1. Gregory-Thompson (1468) - Larson (1847), 1-0. Brandt (1745) - Gregory-Thompson (1468), 0-1. Gregory-Thompson (1468) - Gershov (2240), ½-½. Mercerino (1961) - Gregory-Thompson (1468), 1-0. Gregory-Thompson (1468) - Post (2070), 1-0. Gregory-Thompson (1468) - Kanevsky (2070), 0-1. All the material presented was based on e-Mail exchanges with Bruce Thompson, Sr.